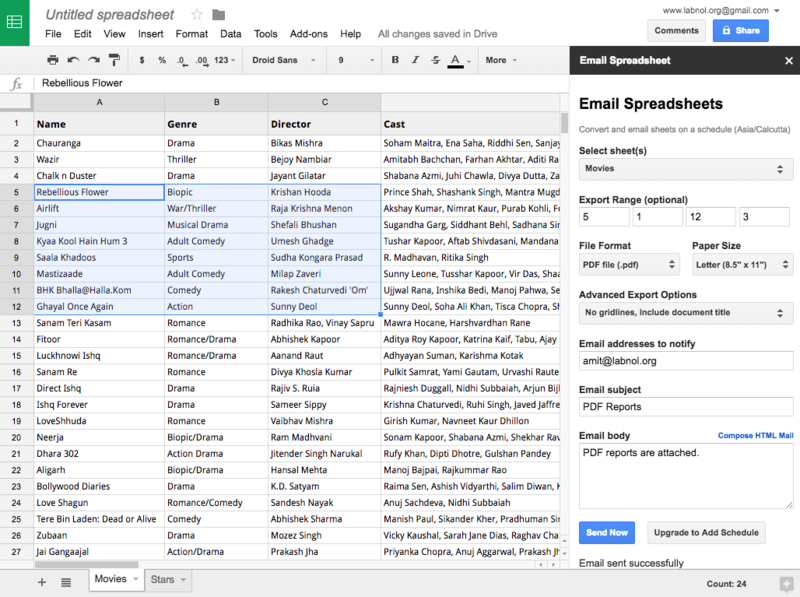 The Email Spreadsheet add-on helps you automatically email one or more sheets inside a Google Spreadsheet to multiple people. You can configure the add-on to convert and email individual sheets or the entire spreadsheet. One of the popular features of the add-on is the ability to email selected range of cells. For instance, if you have a big sheet but you only wish to email a specific range of cells, you can use the Range option to email the selected cells. Every cell in a Google Spreadsheet has a Row, Column (R, C) coordinate. For instance, the cell A1 has Row = 1 and column = 1. The cell E8 has Row = 8 and Column = 5. When configuring the Email Spreadsheet Add-on to convert a range of cells, you need to provide the upper left cell in the range and the lower right cell in RC format. For instance, if you would like export all cells in the A1:E8 range, the R1C1 and R2C2 values would be 1,1,8,5 respectively. You can further select advanced options to show / hide gridlines, page numbers, etc. Internally, the add-on is powered by Google Apps Script.